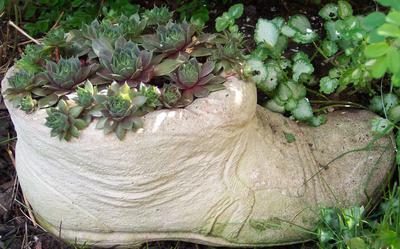 I have a large shoe made of cement that I tucked a few hen & chicks into several years ago. It looks great peeking out from under taller plants in my garden. The plants are hardy enough to stay out there all winter in my Ottawa temperature zone. Lori, that's awesome! I thing that's a great planter, where did you get it? I especially like your plant choices! It's astonishing how tough these little guys are, isn't it?